Discover the Health Benefits of Aromatherapy and Aromatherapy Essential oils in the Comfort of your own Home! Aromatherapy Benefits! 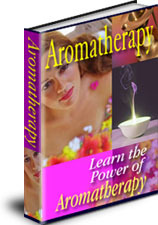 - But What Is Aromatherapy? I hope that in these pages I can provide some insights into the benefits of Aromatherapy, the uses of Aromatherapy Essential oils and some useful Aromatherapy information. It is becoming more accepted that the ancient art of Aromatherapy has tremendous benefits in alleviating the symptoms of many common and annoying ailments, inducing relaxation and in general helping to maintain optimum health. But what exactly is Aromatherapy? The word 'Aromatherapy' was coined by a French Chemist, Rene Gattefosse, in 1928. He discovered, quite by accident, that lavender oil had amazing healing properties. He accidentally burned his hand during a laboratory experiment and instinctively plunged his hand in to the nearest thing that would have a cooling effect and bring some relief to the burning. That cooling medium was a vat of Lavender Oil and he was amazed to discover that the severe burn on his hand healed very quickly and there was little of the expected scarring that is usually the result of burns to the skin. So quite by accident, Rene Gattefosse discovered that Lavender Oil greatly aided the healing of severe burns and also helped to prevent scarring. Others shared his interest and the foundations of modern Aromatherapy were established. Today, Aromatherapy is respected and widely practiced as one of the most popular complementary medicine therapies. In common with many other complementary therapies, Aromatherapy takes a holistic approach to healing by considering the whole person and treating both the physical and emotional symptoms. The use of Aromatherapy Essential Oils is one of the fastest growing forms of natural medicine and is indeed an excellent example of a holistic approach to health - first because essential oils can be used to treat the whole person, body, mind and spirit, and secondly because, unlike conventional medicine, which targets drugs to eradicate a particular disease process, the essential oils may have a specific action on a disease process but will also support and strengthen the person to throw off the disease.